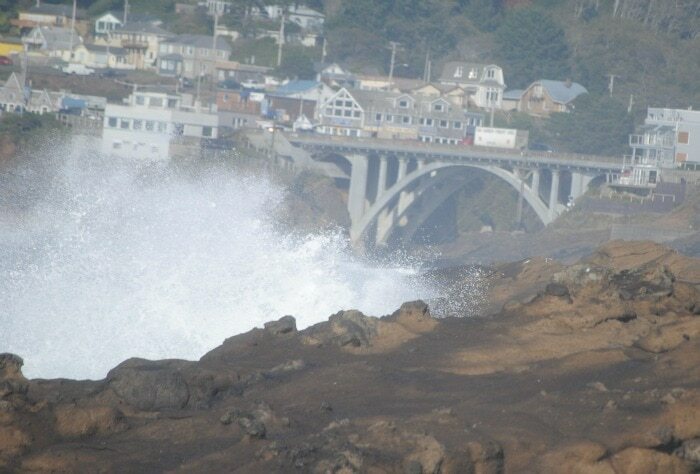 Depoe Bay was once nothing more than a quaint fishing town. Today, while fishermen and their boats still call its small harbor home, the town’s claim to fame is as the “Whale Watching Capitol of the Oregon Coast.” People travel from all over to stroll through the shops, take in the beautiful views of the Pacific Ocean or to go for a trip on one of the whale watching charter boats. With a central location between Lincoln City and Newport, Depoe Bay is a good destination for a day trip or a weekend getaway. Start your day by bundling up and heading out into the mist on an early morning charter for some whale watching or deep sea fishing. You’ll pull back into the “smallest harbor in the world” just in time to have lunch at one of the local restaurants with an ocean view. Try some fresh seafood around at the famed Gracie’s Sea Hag, or have a burger or a bowl of chowder at the Chowder Bowl. After lunch, wander through Depoe Bay’s shops or head over to Newport to check out the Oregon Coast Aquarium. You can also fulfill your need for some retail therapy at the Tanger Outlets in Lincoln City. The best way to end your day is with a sunset stroll along the waterfront in Depoe Bay. Watch out for the Spouting Horn! If you are lucky, you might catch one of the local seals playing in the harbor, hoping for scraps from one of the fishing boats. You may even get to see the local Coast Guard unit doing drills. Before you head home, don’t forget to pick up some salt water taffy or caramel corn for the drive back. Mandy Baker is a writer and photographer whose photos can be found at More Than a Memory Photography. When she’s not writing stories or taking photos, she can be found traveling the country’s coastlines with her husband.